In short: A stylish, nimble and well-balanced compact coupe. Although characterized by its petite proportions, Honda’s refreshed Civic Coupe is big on versatility, a trait evident in the Civic model’s range of configurations, which includes a sedan, hybrid and compressed natural gas-powered vehicle. 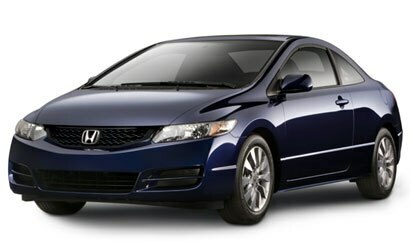 The 2009 Civic Coupe—available in five trims—is a well-rounded economy car, especially given its affordability, small size and sleek appearance, enhanced by a sporty rear decklid spoiler. This nimble five-passenger compact comes standard with a 140-horsepower four-cylinder engine mated to a five-speed manual transmission (a five-speed automatic is optional), enabling decent acceleration and fuel economy. Matching its reliable road performance is a comfortable albeit cozy interior. The LX trim, one up from the base level DX, boasts amenities such as a speed-sensitive volume control; 160-watt AM/FM/CD audio system with six speakers and MP3/WMA playback capability; power side mirrors; steering wheel-mounted cruise controls; and air conditioning. Warranty/Service: 3-year/36,000-mile bumper-to-bumper warranty; 5-year/60,000-mile powertrain warranty; 5-year/unlimited-mile corrosion warranty.